Your birds deserve the best care you can give them and that starts by providing them with quality housing. Having been breeding, rearing, and selling poultry for over 40 years, we’d like to think that we know what poultry keepers want from their housing. We have designed our own range of poultry houses and are proud to offer these to our customers, safe in the knowledge that they will perform as expected for many, many years. Our houses are hand made by experienced craftsmen, here in the Shropshire countryside. The houses come flat packed with detailed instructions ready for easy home assembly. 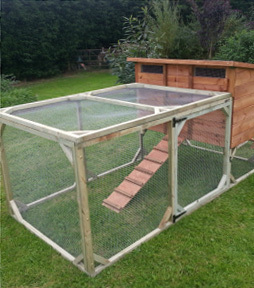 If preferred, we can offer an “onsite” assembly service with delivery of your chickens. Our houses are currently available in 2 sizes: Standard Triple and Super Six. We can quote for bespoke houses upon request. We can supply everything you need to get your own egg production started right away. Our special Starter Pack deals will have you up and running in no time. 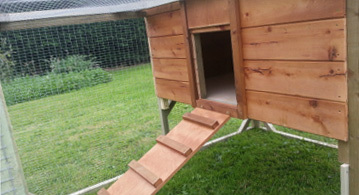 Quality hand made house for 3 chickens. 25kg bag of Layer pellets. 1 x 3kg plastic feeder. Onsite assembly by our own staff. Quality hand made house for 6 chickens. *Choice of pullets from our Laying Pullet page subject to availability. All of our layer pullets are fully vaccinated and guaranteed for 6 weeks. Stand alone poultry houses also available without birds and equipment. Please call us for details.